It is a handy remedy when you are attacked by hypo-glycemia. People with diabetes and others with hypoglycemia, or low blood sugar, run out of energy when their sugar (glucose) levels drop too low. These reactions can lead to unconsciousness if not treated in a timely matter. Reactions can occur suddenly, however glucose levels can be brought back to normal by eating or drinking carbohydrates. It is recommended by The American Diabetes Association (ADA) to carry something containing 15 grams of glucose at all times in order to treat these sudden reactions. 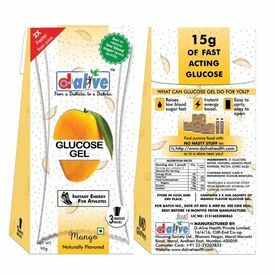 D-Alive’s glucose gel is 2x times faster than juice, provides instant energy and is easy to carry and open. Why Glucose Gel for Diabetics? The glucose gel is a liquid and a measured portion. When people hit severe hypos, they can never chew. Infact they even spit out anything they can’t process. The glucose gel will dissolve much faster than any candy or juice even if left in the mouth and increase sugars. Besides, the measured dose allows you to come back to normal sugar level without hitting a hyperglycemia because you consumed too much sugar in trying to get out of a hypo. The gels are also very easy to carry, this means people with diabetes and their relatives can have it with them at all times during urgencies when you don’t have time to run and look for supermarkets or stores to buy something apt. For e.g. If a person with diabetes feels low in the middle of a meeting, they can easily pull out a sachet from their pocket and consume it without having to trouble anyone else around or them even knowing. Since it is fast acting, they’ll feel back to normal faster than eating anything with table sugar or fructose. Ingredients : The product is 15 grams of fastest acting carbs i.e. D-Glucose. It contains natural fruit powder, citric acid, water and sodium benzoate to support composition and shelf life.